Between 1999 and 2002, metal detecting recovered a variety of metal objects including a late Bronze age socketed axe fragment, a Roman coin and a medieval lead seal matrix. Also found were a number of Late Saxon, medieval and post medieval metal objects. Early post medieval threepence of Elizabeth I, 1578. Mintmark of Greek cross. December 1999 - January 2000. Metal detecting. Medieval lead seal matrix, 13th century. Now very crushed but probably originally thin, flat and circular, with a flat pierced lug at the top. The central design can now no longer be made out. The surviving part of the legend reads '…DWAI.LEMEC…'. May originally have been S'EDWA[RD]I LE MEC…(Seal of Edward Lemec..), Lemec being either the first part of his surname, or meaning Edward the Mec. August - September (2000?). Metal detecting. Early post medieval button made in two halves. The front is a rounded cone of grey bronze (high tin?) and the back is slightly convex with a circular integral loop. Post medieval Norwich trader's token. Obverse: FRACIS MORLY around the arms of the Grocers' Company. Rev: OF. NORWICH around F.M. Williamson no. 173, 17th century. Identified by H. Geake (NCM) K. Hinds (NLA) 7 April 2000. A. Rogerson (NLA), 5 April 2004. Late Bronze Age socketed axe fragment (S1). Late Saxon (S2), medieval and post medieval metal objects. A. Rogerson (NLA), 5 April 2005. <S1> Illustration: Ashley, S.. 2005. Drawing of Late Bronze Age socketed axe fragment.. Film. 1:1. <S2> Illustration: Gibbons, J.. 2005. 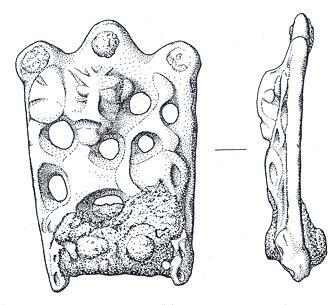 Drawing of a Late Saxon stirrup-strap mount. Film. 2:1.